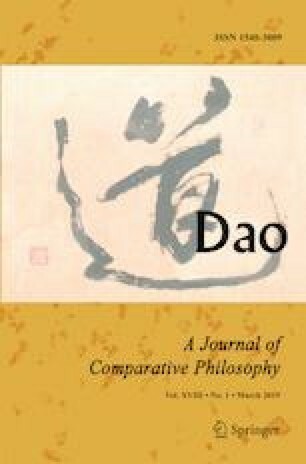 This essay analyses the second chapter of the Zhuangzi 莊子, the “Qiwulun 齊物論.” After a brief examination of its main ideas, it will be argued that the “Qiwulun” needs to be considered not as an equalization that makes everything indistinguishable but as a discourse on corresponding things. A more attentive analysis of this correspondence among the myriad things will lead to the consideration of their mutual transformation. The conclusion is that, contrary to the ontotheological nature of Western metaphysics that imposes a single logic for its hierarchical structure Being-beings, the correspondence of myriad things allows the differentiation and assimilation of values in a comprehensive and harmonious fashion. Thus, the essay offers an ethical reading of the “Qiwulun” and considers its significance in the contemporary world. The author would like to thank Graham Parkes, Robin Wang, and Antonello Palumbo for their precious comments and suggestions. Professor Parkes kindly proofread the text as well. Many thanks also to the two anonymous reviewers for their attention and help.